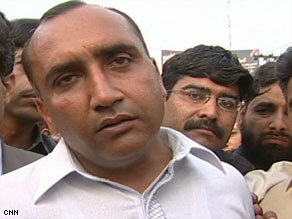 LAHORE, Pakistan (CNN) -- His job was to drive the bus. But Meher Mohammad Khalil is now being hailed as a lifesaver. On Wednesday Meher Mohammad Khalil went back to the place where gunmen attacked his bus. When gunmen jumped out of bushes and began spraying bullets at the bus carrying the Sri Lankan cricket team Tuesday, Khalil quickly sized up his options and got everyone to safety. "First I thought there were some firecrackers going off. Then, when I saw the elite force cars in front of me taking fire, I immediately lost my voice," Khalil told CNN on Wednesday. Khalil returned to the scene of the attack in the Pakistani city of Lahore on Wednesday to honor those who were killed and to place flowers in their memory. One of the dead was Zafar Khan, a friend and fellow bus driver who had been in a vehicle behind Khalil. "My eyes filled with tears that these were people that I was eating with and who died in doing their duty." Khalil had been part of a convoy heading to Gaddafi Stadium, where the Sri Lankan cricket team was to continue a match against Pakistan. The Sri Lankan cricketers praised Khalil's quick thinking and action, saying he saved their lives. Six team members were injured by broken glass and shrapnel. Team captain Mahela Jayawardene wrote on his Web site of Khalil: "He probably saved our lives, showing remarkable bravery in the face of direct gunfire to keep the bus moving." Crowds mobbed Khalil as he paid his respects at the place where his life changed in an instant. "He is a hero, a real hero, a real man of the people," a man in the crowd said. Private donors in Lahore have rewarded Khalil with 300,000 rupees (more than $3,000) -- a small fortune for a Pakistani bus driver. Today, Khalil says all he can feel is pain of the loss of life. And he called on the attackers to recognize that their victims are humans just like them, with mothers and sisters. "For God's sake, please stop this terrorism and let this nation breathe a sigh of relief," he said.